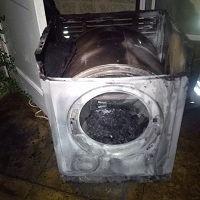 After a six month long campaign by London Fire Brigade, white goods' giant Whirlpool has finally told consumers to unplug dangerous, faulty tumble dryers. The Brigade's fire investigators found that a serious blaze that ripped through an 18 storey tower block in Shepherd’s Bush last August was caused by a faulty Indesit tumble dryer which was subject to 'corrective action'. As soon as it suspected the cause of the fire was the dryer, the capital's fire chiefs called on Indesit's parent company Whirlpool to urgently change its advice to consumers. The company has previously maintained that people could continue to use the affected dryers while they were waiting for them to be modified as long as they were not left unattended while they were being used. The Brigade strongly disagreed and urged anyone with one of the models in question to immediately unplug the machine and stop using it. After pressure as part of its Total Recalls campaign, which is calling for a number of measures to improve white goods' safety, Whirlpool has updated the safety advice on its website(opens in a new window). The company now says "if your tumble dryer is affected by this issue then you should unplug it and do not use it until the modification has taken place. London Fire Brigade's Assistant Commissioner for Fire Safety Dan Daly said: "This change of advice could save lives and we are extremely relieved that, after six months of campaigning by the Brigade, Whirlpool has finally brought its advice in line with our own. "We attend nearly one fire a day involving white goods and strongly believe that if your appliance is subject to a safety or recall notice or you think there is something wrong with it you should unplug it immediately and contact the manufacturer or a qualified repair technician." The safety notice issued by Whirlpool identified a potential concern with two types of tumble dryer manufactured between April 2004 and September 2015. The affected brands are Hotpoint, Indesit and Creda, Proline and Swan.